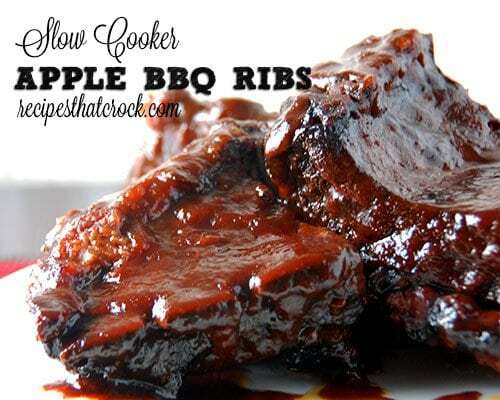 Slow Cooker Apple BBQ Ribs - Recipes That Crock! Sweet and tangy come together for an amazing flavor combination with these Slow Cooker Apple BBQ Ribs from Gooseberry Patch’s 101 Super-Easy Slow-Cooker Recipes Cookbook. We love ribs in this house. Michael would eat ribs every night if he could. He gets so excited when I tell him I’m making ribs that I almost feel bad eating any myself. My hubby loves his food and ribs are right up at the top of his list of favorite foods. BUT Momma loves ribs too, so I don’t feel too terribly bad about eating a few ribs myself. Now Ryder is our picky little texture eater (just like his Momma) and wasn’t quite sure what to do when we introduced meat. Then he tried these Slow Cooker Melt Away Ribs and couldn’t get enough. 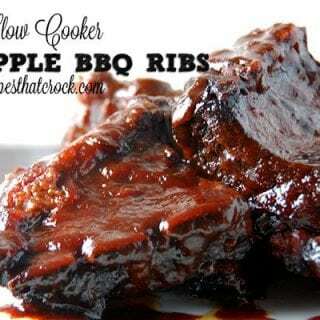 So I was hopeful he would like these Slow Cooker Apple BBQ Ribs too. 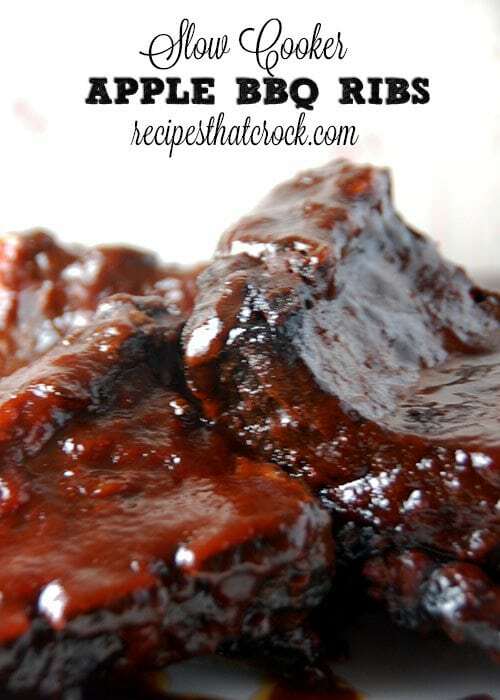 The sweet and tangy mixture of the apple butter and the bbq sauce is brilliant. I had actually never had apple butter before or even had a recipe with apple butter in it before. So this was a real treat for a first experience. The flavor of the meat and sauce together is just perfect! Sprinkle your ribs with your salt and pepper and bake for 30 minutes on a baking sheet with sides. Cut your onion into quarters and set aside. Mix together your apple butter and favorite bbq sauce and set aside. Cut your ribs into serving size pieces and place into your slow cooker. Place onion quarters on top of your ribs and drizzle the sauce mixture over everything. Enjoy and just try to keep the kids in your life from eating all of your ribs! I changed this and am using a pressure cooker works much and much tastier.